Last week I started my introductory series on the basics of cooking here on Basic and Simple. But the magic of fine dining does not only happen in the kitchen. When the evening gets late, the table is cleared and the wine is done for, the digestif becomes the center of attention. And with it, the old debate about the true gentleman’s drink comes up. While whiskey has become increasingly popular throughout the world as of late and gin always has been the go-to option for the undecided, albeit rather served as an aperitif, there also is: The rum. But while whiskey drinkers only have to debate about the proper way to serve a drink and frown upon the people drinking it “on the rocks”, us poor rum lovers have to cope with our drink of choice being inevitably connected to sugary longdrinks, fruity cocktails and party drinking. And pirates, of course. But there is so much more to the world of rum, which is, once delved into, as manifold as the world of whiskey. While they debate about the pros and cons of Speyside versus Islay whiskeys, we can throw in the merits of Jamaican rum over those of Barbados’. And with this, I want to start another series. This first post will serve as an introduction and discuss the basics differences of rum and rhum, the right choice of a glass and give some basic advice. Finally I will give one first rum recommendation leading up to a series of posts every week or so of further such recommendations. Let’s get started then with our introduction to rum, shall we? The English word “rum” is a little bit hazy as it encompasses all sorts of rum, regardless of its origin. So we should look into the native denominations. Apart from the English Rum, we have Ron which is, of course, the Spanish term, while rhum is French. But what seems like only a semantic difference and nitpicking actually bears tremendous significance. Because with the different name comes a different culture of origin – and a different production process. While all drinks are made from sugar cane and both are distilled roughly the same way, the Spanish ron and the English rum are made from molasses, the thick gooey sugar cane syrup that once famously swept across the downtown of Boston in the Great Molasses Flood. Most Spanish speaking countries and islands mainly produce “ron anejo”, which is smoother and lighter, while the rum distilled in English speaking islands like Barbados commonly are fuller and stronger in taste. Meanwhile, the French rhum agricole is made out of sugar cane juice, which brings with it a stronger regionalism, as the juice can only be extracted from the cane right away and has to be processed within roughly 36 hours. So while most industrial rums nowadays use molasses from Brazil, the French islands of the Caribbean still produce sugar cane and distill their rhum agricole from it. This rhum has a lighter body than his molasses produced Spanish and English counterparts, but at the same time has an easier time carrying fruit notes. Great, now let’s crack open a bottle and… pour the rum in which glass exactly? With those basic distinctions down, we have to answer another elementary question and decide from which glass to drink our sugar cane product from whichever region and with whichever name. Sadly, there is no such thing as a “rum glass” which is universally agreed to and which is labeled and sold by this name. So we have to turn to alternatives. If you come from a whiskey drinker’s background, you might have a simple tulip formed nosing glass at your disposal. Those will do quite well for rum as well, even though they tend to be a bit thick walled. But nonetheless, this is our option A for getting started in the journey into the rum world. Priced at $5-10, they are a cheap alternative if you want to first try out a little before committing to rum as your liquor of choice. Option B is the glass I personally use for rum and has served me well throughout the years and various rums, rhums and rons. 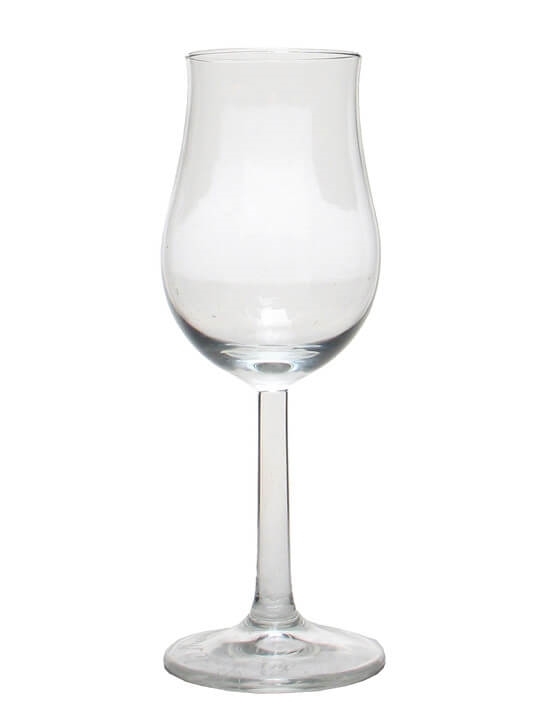 It is a Riedel Cognac Glass, equally tulip formed as option A. While the company is by no means mandatory and any equally formed cognac glass will do, I would strongly recommend Riedel. They use manufactory techniques such as ever so slightly roughing up the inside of the glass to make the surface bigger and giving the drink more breathing space and generally produce a very high quality of glassware. I personally use the middle priced line of glasses, the Vinum series. A pair of Riedel Vinum Cognac glasses will put you at $50, but it is money well spent once you decide to dedicate yourself to rum. And properly handled, those glasses will last a lifetime and will indeed make a strong difference in taste. First of all, be prepared to spend some money on your rum. A good point to start considering rum as actually good would be around $40. Even though I will present some rums below that threshold, most of the stuff you find below it is rubbish and designed and suited for cocktails and mixing. Most of the rums I will recommend will be in this area of pricing. Secondly, let your rum breathe. After pouring, let it sit for five to ten minutes or so, swirling it a little. Use the time to enjoy the scent and the aromas. Thirdly, pour yourself a glass of water to go with the rum and alternate between rum and water. A sip of water right after a sip of rum will wash up some different flavors, for example. Also, the water will help to clear your mouth of the taste and let you enjoy the next sip fresh again, as your taste buds will not be numbed. The fourth and most basic advice of all: Never down rum as if it were a shot. And never drink straight from the bottle. You are not Jack Sparrow and such waste will only make you look like the dude with the glass eye. And now, to finish it all off, I would like to recommend you one of my favorite rums, commonly considered to be one of, if not the, best rums in the world in its price category. The 12 year old El Dorado Rum. The El Dorado brand of rum is distilled by various distillers in the Demerara region of Guyana in South America who claim that some of the equipment has been in use for 200 years, giving the El Dorado a long history. The El Dorado brand has a number of rums, but its flagships are the 12, 15 and 21 year old rums, aged in oaken Bourbon barrels, giving them a smooth and light brown color. Noteworthy is, that rum is always a blend of different batches and its age denomination is usually based upon the oldest used rum. So “12 years old” would normally mean that only a part of the rum has aged for that long and most of it will be younger, letting Bacardi sell you “8 year old rum” – of which only a percent or so is actually that old. But the distillers of Demerara go the other way around: They use the age to denominate the youngest used rum. So a 12 year old El Dorado is in average way older than other rums denominated as, say, 15 years old. The 12yo El Dorado, the youngest of the bunch, is the perfect “Beginners Rum”. It is moderately strong (40% alcohol, and as in wine, the strength of the liquor hints at how full its body is) with a rich bouquet. The smell is that of baking spices: vanilla, cinnamon, rich brown sugar and a hint of nutmeg, mixed with the oaken smell from the barrels and numerous other scents that have left me and my friends debating for literally an hour at an end at times. Everyone will discover something in this rum, making it such a great basis to start off with. Taste wise, it bears the same flavors with added hints of orange peel and citrus fruits and, at least I insist so, a very faint hint of tobacco. It is sweet, but not overwhelmingly so. This, again, makes it the perfect rum to begin with, because it is bound to appeal to a larger audience by not kicking your taste buds like a mule. But you will have a lot of fun trying to distinguish new flavors with every sip. In the throat, its low sharpness will also make it far more approachable, because it will not have an “after burn”. Instead, it goes down smoothly and leaves behind only an aroma of oak and the baking spices, as well as a pleasant sweetness. So, all in all, for its comparatively low price, the El Dorado brings an enormous amount to the table. And I will always rank this rum among my Top 10, just because of its price/performance ratio and it being a very, very solid foundation, that got me started into actually opening up a rum collection and buying my set of Riedel glasses to properly enjoy it. So, that’s it for today folks. Enjoy your rum, the forgotten gentleman’s drink. If you liked this article, follow Basic and Simple on Facebook and Twitter or subscribe to our RSS feed. Your passion for rum is inspiring. Thank you for your thoughtful and well-written rum introduction essay.